A Review by Indie Bookworm Cathy. "The blurb for this novel is short and to the point. And it was the blurb that caught my attention and made me decide to read the sample on the Amazon site. As soon as I started reading I was engaged by the hero of the nation, Jason Bryggs. I thought he was going to be just another city slicker looking to make a killing for himself (which he is) but the cleverness of this piece of writing is that you like Jason, sympathise with him and want things to work out. Author John Problem has a healthily irreverent attitude to the government and a very funny way of writing about "The Prime Minister and Nick". The opening of the book explains what Jason Bryggs' new job is. So, I'm giving away no secrets by telling you that it is to sell off whatever national assets he can, in order to reduce the National Debt. And Jason sets about his task with gusto as there's no shortage of rich buyers out there looking for the chance to buy Britain's heritage. Of course the plot derives considerable plausibility from the big sell-off by the Thatcher government in the 1980s of British oil, gas, electricity, telephones, water companies, coal and steel. It's not such a big step to what Jason Bryggs is commissioned to do to-day. At times this book is laugh aloud funny. The writing style is sharp and pithy and moves along at a cracking pace. I read it in a couple of sittings and thoroughly enjoyed it. 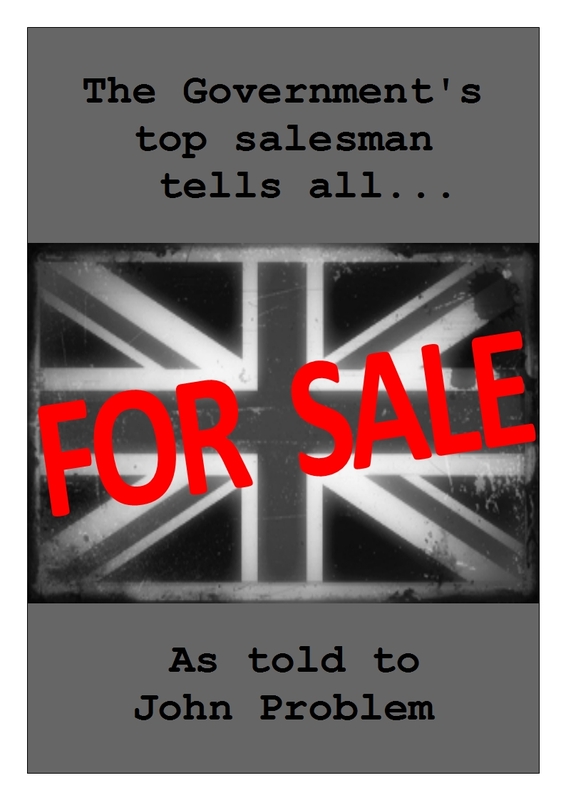 Light hearted and entertaining but with overtones of seriousness, The Government's Top Salesman Tells All is well worth a look." Thank you, Indie Bookworm, your review is much appreciated. John.